Kempenfest is a very large, three-day craft show and fair held each year in Barrie, Ontario right on the shore of Lake Simcoe, and it seems that every year there is some form of bad weather. Last year it rained so hard there was flooding, and this year, my first time to do the show, there was a severe thunderstorm with high winds and hail and even the threat of tornadoes. With over 300 vendors, there were a lot of tents that needed to survive the night. Not all of them did. I didn't sleep well in my hotel on Sunday night because of the thunder and lightning, and a bit because I was worried about how my tent would fare in the high winds. 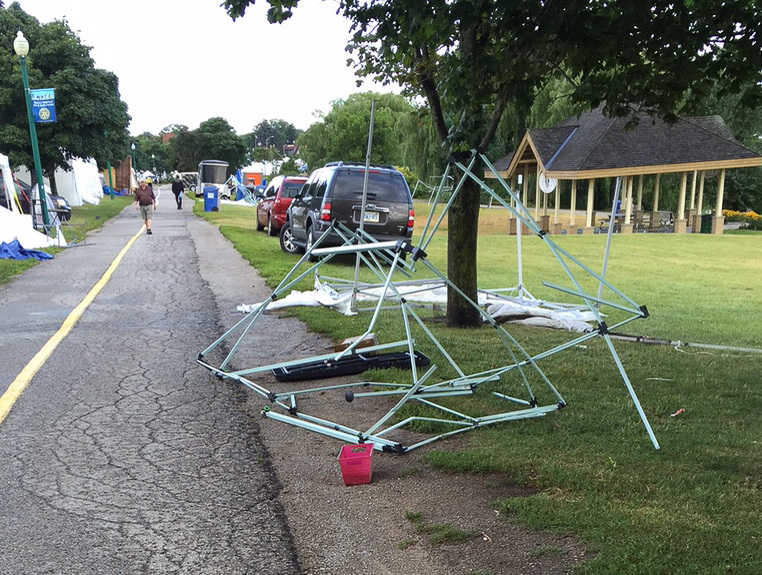 I raced to the venue early Monday morning (a civic holiday) and was delighted to find my tent in perfect condition. Many others were not so fortunate. There were the remains of tents scattered all through the venue, and at least a couple of vendors who had left their inventory in their tents overnight, arrived to find that they had lost everything. Some vendors just abandoned their tent frames and the piles of "bones" made me think of the elephant graveyard from the Tarzan series. I am glad that I made the large investment in a heavy-duty, waterproof rather than water-resistant, tent. My husband and I also did a very good job of securing the structure with stakes on each leg, stakes and guy wires holding down the top at each corner, and 40 pounds of cement weights on each leg. Setting all of that up was a lot of work, but it was worth it. The setting by the lake. 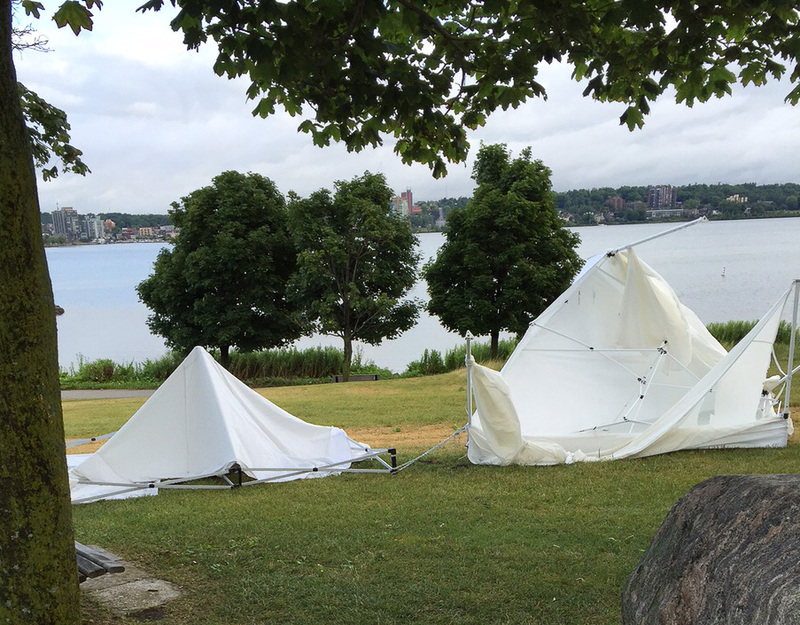 These tents almost landed in it.